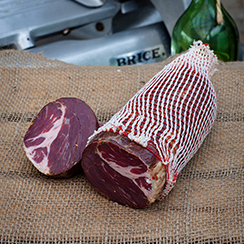 Bresaola originated in small regions in the mountainous far north of Italy but are now used widely. It is made from top (inside) round, and is lean and tender, with a sweet, musty smell. It originated in Valtellina, a valley in the Alps of northern Italy’s Lombardy region. INGREDIENTS: Australian Beef Halal (96.26%), Spices (3.74%): Salt, Dextrose (either Maize or Tapioca), preservative (251), antioxidant (301), herbs and spices (bay leaves, marjoram, rosemary, coriander, pepper), dehydrated vegetable (garlic), maltodextrin (Maize), fruit oil and vegetable extract. 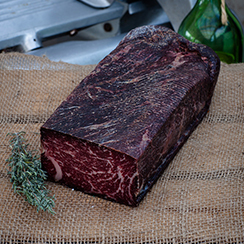 great thing about Wagyu beef is that even though the meat is heavily marbled with intramuscular fat, this type of fat is of the ‘good’ or unsaturated kind. INGREDIENTS: Australian Beef Halal (96.26%), Spices (3.74%): Salt, Dextrose (either Maize or Tapioca), preservative (251), antioxidant (301), herbs and spices (bay leaves, marjoram, rosemary, coriander, pepper), dehydrated vegetable (garlic), maltodextrin (Maize), fruit oil. INGREDIENTS: Australian Pork (MIN 96%), Salt, Dextrose, Red Wine (contains sulphites), Cloves, Starter cultures, spices, antioxidant (316), preservative (250,251) + chilli. 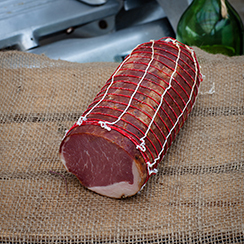 The cotechino is an Italian charcuterie product, similar to salami, but requiring cooking; usually it is boiled at low heat for about four hours. Its name comes from cotica (rind), but it may take different names in the different production areas. It is prepared by filling the natural casing with rind, pork meat (usually of secondary choice), and fat mixed with salt and spices; in industrial production, nitrites and nitrates are added as preservatives. 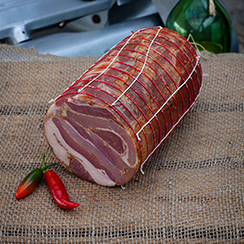 INGREDIENTS: Australian Pork (Min 98.48%), Starter cultures (0.75%), Pepper (0.35%), Salt flossy (0.30%) and Nutmeg (0.12%). Chorizo (Spanish) or chouriço (Portuguese) is a term originating in the Iberian Peninsula encompassing several types of pork sausages. 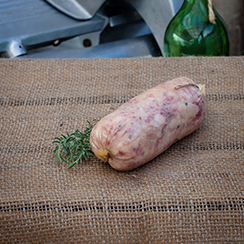 Traditionally, chorizo is encased in natural casings made from intestines, a method used since Roman times. 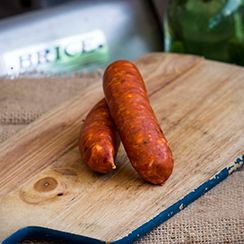 Chorizo can be a fresh sausage, in which case it must be cooked before eating. In Europe, it is more frequently a fermented, cured, smoked sausage, in which case it is often sliced and eaten without cooking, and can be added as an ingredient to add flavour to other dishes. INGREDIENTS: Australian Pork (MIN 91%), Water, Salt, Spices, Garlic, Antioxidant (300), Dextrose, Starch, Spice extract, Sugar, Preservative (250). Guanciale is a specialty of central Italy, particularly Umbria and Lazio. 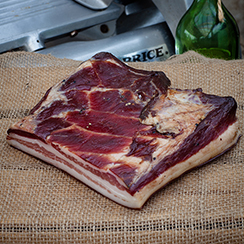 It is an unsmoked Italian bacon prepared with pig’s jowl or cheeks, rubbed with salt, ground pepper and cured for 3 weeks. 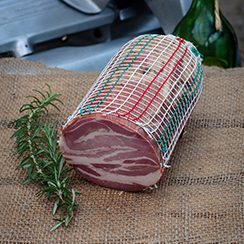 Its flavour is stronger than others such as pancetta yet its texture is more delicate. INGREDIENTS: Australian Pork (MIN 96%), Salt, Dextrose (Maize), Red Wine (contains sulphites), Starter Cultures, Garlic, Spices, Antioxidant (316), Preservative (250,251). 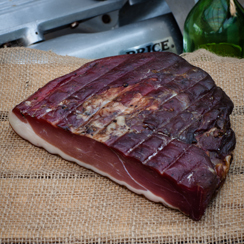 A cured delicacy which is lean and ruby in colour, Made from the loin and seasoned with cloves and red wine it is Low in Fat and has a unique texture. INGREDIENTS: Australian Pork (MIN 96%), Salt, Dextrose (Maize), Red Wine (contains sulphites), Cloves, Starter Cultures, Spices, Antioxidant (316), Preservative (250,251) + chilli. 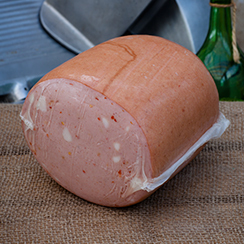 Mortadella originated in Bologna, Italy. It consists of ground pork meat and long strips of fat, giving it the mosaic appearance, often mixed with other meats such as beef and veal, or herbs, fresh garlic, peppercorns and chilli. INGREDIENTS: Australian Pork (MIN 85%), Beef, Water, Salt, Dextrose (Maize), Spices, Wine, Milk solids non fat, Soy concentrate, Preservative (250), Antioxidants (300,316) Food acid (332), Acidity Regulator (575) + chilli or truffle. INGREDIENTS: Australian Pork (MIN 96%), Salt, Dextrose (Maize), Red Wine (contains sulphites), Starter Cultures, Garlic, Spices, Antioxidant (316), Preservative (250,251) + chilli. 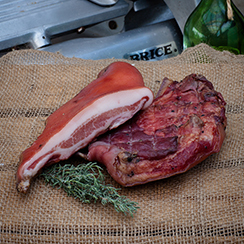 Pancetta that has been infused predominately with Rosemary among other spices. The Stesa (flat) version of Pancetta is Pork Belly seasoned the same as Pancetta and is predominantly used by chefs for cooking. INGREDIENTS: Australian Pork (MIN 98%), Salt, Dextrose (Maize), Red Wine (contains sulphites), Starter Cultures, Garlic, Spices, Mineral Salts (341), Antioxidant (316), Preservative (250,251) + chilli. 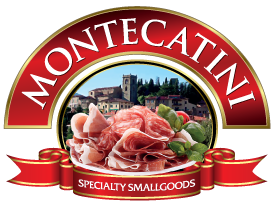 Prosciutto is a dry cured ham Traditionally, it is seasoned with salt, and cured over a few months. It is one of the most renowned and expensive legs of cold cut meats. INGREDIENTS: Pork (Min 96%), Spices 3.50%: Salt, dextrose (either maize or tapioca), nitrate/nitrite (E252/250), Antioxidants (E301), Starter cultures. 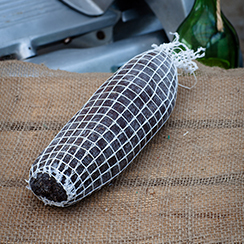 A traditional Prosciutto that has been infused with Italian Black Summer truffles.